Take this as a friendly reminder, Father’s Day is this coming Sunday. Time to give old dad some time and appreciation. I’m fortunate that my dad, after experiencing a serious health crisis a year a go, is still around. In fact, seeing him go through such a crisis with a positive attitude and determination makes me love and appreciate him even more. He’s quite a guy and I’m proud to call him my dad. If you’re reading this dad, Happy Father’s Day! I love you and thank you for being supportive, inspiring, and passing all your amazing qualities on to me. Unfortunately, I won’t get to see my dad on Father’s Day, but I bet my mom will whip up his favorite breakfast, pancakes. My mom makes big fluffy and delicious pancakes, but there not vegan. 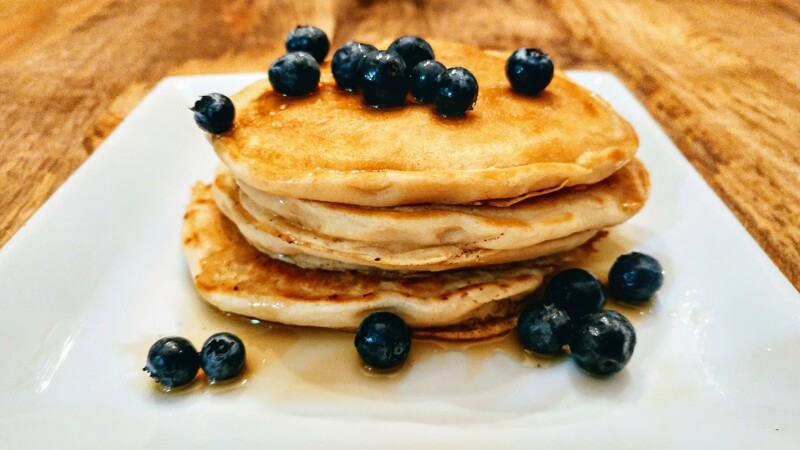 Although it’s easy to veganize a batch of homemade pancakes, I’ve never really mastered them because I could never get them to replicate the taste and texture of my mom’s. Sigh, sorry kiddos. Until, I got my hand on the NYC Vegan, Iconic Recipes for a Taste of the Big Apple cookbook by my dear friends Michael Suchman and Ethan Ciment, better known as the Vegan Mos. Chalked full of iconic recipes from the Big Apple, I was immediately drawn to the Dinner Pancakes. On a busy Saturday morning, I managed to whip up the batter up in no time. Low and behold before my very eyes, I witnessed the most beautiful sight. Big fluffy pancakes just like moms! I couldn’t wait to sink my teeth into a bite. Would they hold their own against my mom’s non-vegan version? To my surprise YES, they did! They were delicious and devoured by my pancake deprived household. These are the pancakes I loved as a child, made for my own child, and ordered every time I visited a diner before I went vegan. Now I can enjoy them again, even at dinner, thanks to Michael and Ethan. I don’t think they intended to fill such a void in my life, but they did. Thank you! I can’t wait to dive into the rest of the recipes in the book. It would make a great Father’s Day gift if your dad likes to cook. The recipes are made with simple ingredients and easy to follow. The most amateur cook can pull them off like a master. Additionally, this book is for anyone who has a spark for the Big Apple. Michael and Ethan’s personal account of their beloved city and the connection they each have to their recipes is heartfelt. They give a close-up view of who they are, making you feel like their eating alongside you. If you didn’t love them before, you will now. 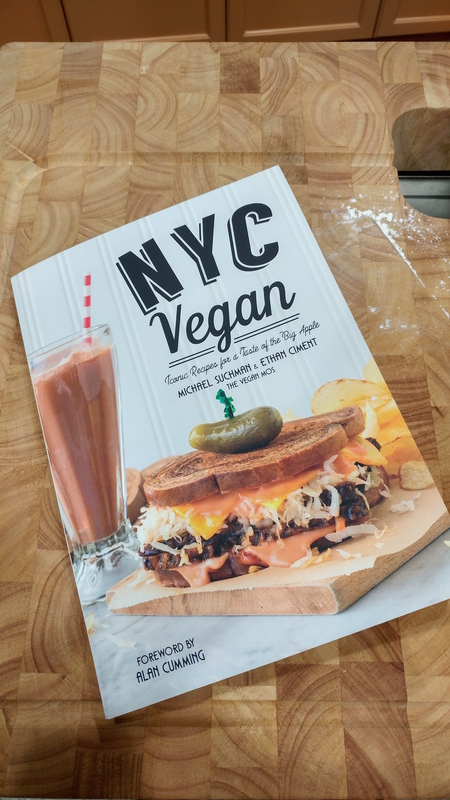 NYC Vegan is now available online and at your local bookstore. Happy Father’s Day to all you amazing dads out there. I hope you get your pancakes.